Barefoot Angie Bee: beautiful bee pollen! An estimated 26 million Americans suffer from seasonal allergies and an etimated 50 million who suffer from all types of allergies. I fall into the seasonal group. I have not always been an allergy sufferer. I started being affected by allergies after having my oldest son. I can count on being stuffed up and sneezing my head off daily from mid August until at least the first solid freeze sometime in the end of September/ early October if I am lucky. Earlier this year I sought out bee keepers in my area and wanted to apprentice with someone. I met Jerry who lives just up the road from us. He generously took me under his wing and began to teach me about beekeeping. I regret that I did not have enough time to go to his house as much as I would have liked but I learned so much from him. Today as I was pulling into the driveway I see Jerry and his wife pulling out. He had stopped by to drop off a jar of pollen from his bees for me to help with my allergies. Jerry and I stay in touch through facebook so he knows of my allergy complaints and was so kind to think of me and bring me some of this bee gold! When you put a small amount of the seemingly harmful irritant (bee pollen from local flower pollens) into your body, your immune system builds defenses or immunities against the foreign substance. This will make the immune system "ready" to handle any of the substance in larger quantities the next time it is in contact with it. So there is no "hyper-reaction." It is a similar concept to using a vaccine. Bee pollen goes quickly into the blood stream in small doses, just enough to kick your immune system into gear. See that little yellow bunch of stuff on the bee's legs? 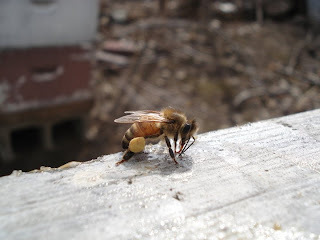 That is how the bees transport the pollen back to their hive. They have little hairs all over their bodies that snag pollen granules. A honey bee moistens the forelegs with a protruding tongue and brushes the pollen that has collected on head, body, and forward appendages to the hind legs. 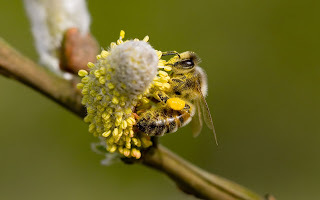 The pollen is transferred to the pollen comb on the hind legs and then combed, pressed, compacted, and transferred to the corbicula on the outside surface of the tibia of the hind legs. The corbicula is also called the pollen basket. Aren't they cute with their fuzzy heads and pollen baskets! After the honey bees collect the pollen from flowers at the end of the day they return to their hive. Bee pollen is then collected for our consumption when the honey bees crawl through a special screen put on the hive by the bee keeper that knocks off the pollen collected and it drops down into a container so it can be removed. Collecting of pollen is done by the beekeeper in the spring and the fall when the common allergens are present. I am a fall pollen sufferer and this pollen in the photo below may not help for this year but I am going to start taking it anyways. Ideally one should start taking pollen in small amounts about a month before symptoms typically start. So about June of July for me to get the best results and eating a little bit each day. About a teaspoon-tablespoon daily. Pollen looks dry but is actually a bit sticky and moist. It tastes savory and sweet with an earthy hint to it. It tastes the way many natural foods stores smell. Check out the differences in color! Beautiful stuff. I had envisioned many days of this summer spent tending bees with my friend Jerry. Life happened and I didn't get over there nearly as much as I wanted to. Seeing Jerry today and his tempting comments about Goldenrods flowering and attracting many insects just waiting to be photographed, put beekeeping in mind again. I am thinking that beekeeping should be made a priority for spring of 2012. I started taking local bee pollen early last spring, and it really reduced my allergies this summer. mine were never terrible, and they weren't entirely gone, but the difference was very noticeable. love the stuff! Very cool! Do you just swallow the spoonful or do you chew it up? I think it's so cool that you got involved with this, even if not to the extent you wanted to. And the pollen is gorgeous. I've always heard that eating local raw honey is a good way to combat allergies, so this all falls in line with that. There are many benefits we can derive from taking bee pollen as part of our diet. But the first time, you have to try a few so you will know if your body system can tolerate as some people need to increase first their tolerance in order to take them in quantities that they like. And yes, bee pollen is great for improving your body resistance to allergies. Me, I use bee pollen primarily for energy booster. Luckily, I got a bonus as taking bee pollen for weight loss.